After the dissolution of the Hopedale Community in 1856, no effort was made to collect the participants' stories for over 50 years. By that time, most of those who had been adults during the 1840s and 1850s had passed away, leaving the story to be told by people who had been children during Community days. Their stories were published as Hopedale Reminiscences in 1910. 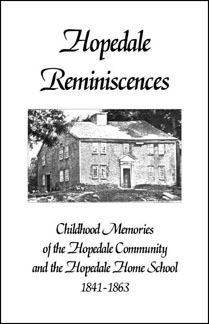 The eleven sketches that make up Hopedale Reminiscences form the core of this book. To this has been added a chapter from the autobiography William F. Draper, the son of Ballou's nemesis George Draper; the proceedings of a reunion of the Home School from 1867; and a list of the students and faculty of the school.